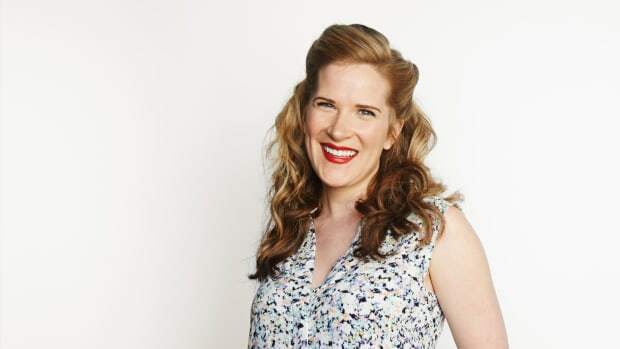 On my wedding day I was lucky enough to have my favorite hairstylist—who has been cutting my hair since I was 13 years old—arrange my hair beautifully. I trust her, we have great communication, and she knows my hair and my sense of style. But let’s face it: That is a rare phenomenon for most brides. Whether you’re off in some exotic destination or just putting your locks in the hands of someone new in your hometown, it can be nerve-racking to trust your hair to a complete stranger, professional or not, on the most important day of your life. Luckily, there is another option. 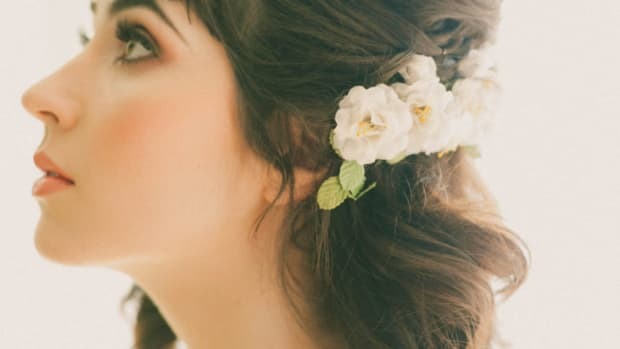 Styling your own hair on your wedding day is totally doable (not to mention kinder on your budget). 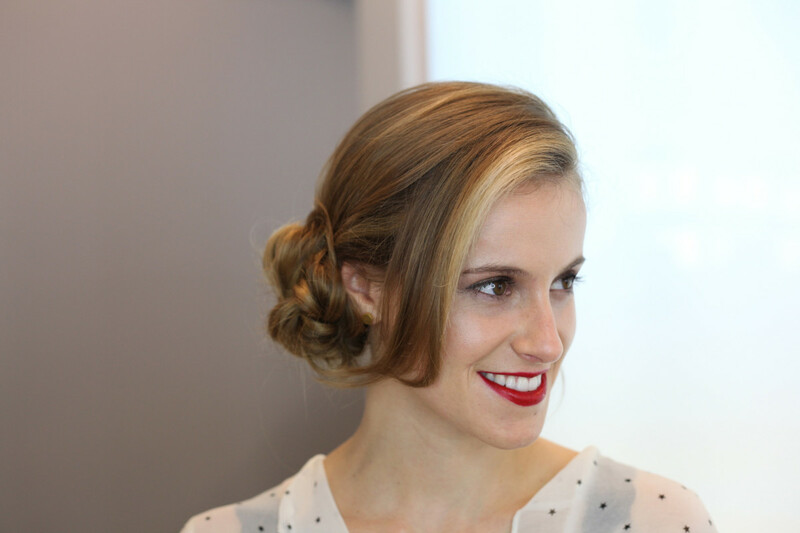 To prove that DIY wedding hair is possible, I sat down with my favorite hairstylist, Mary Shaffer from PR at Partners Salon, to demonstrate an ever-so-bridal side chignon. Blow out and curl your hair the day before for best results. 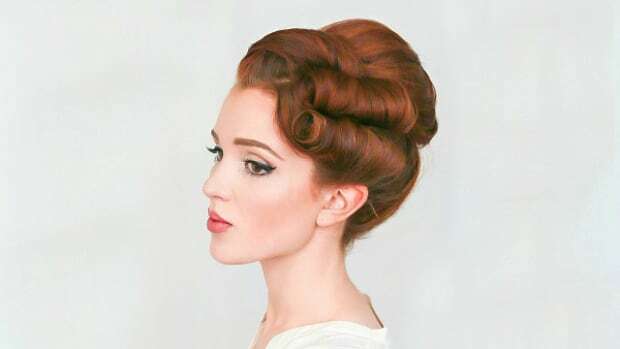 This look, like all updos, is best achieved with second-day hair. 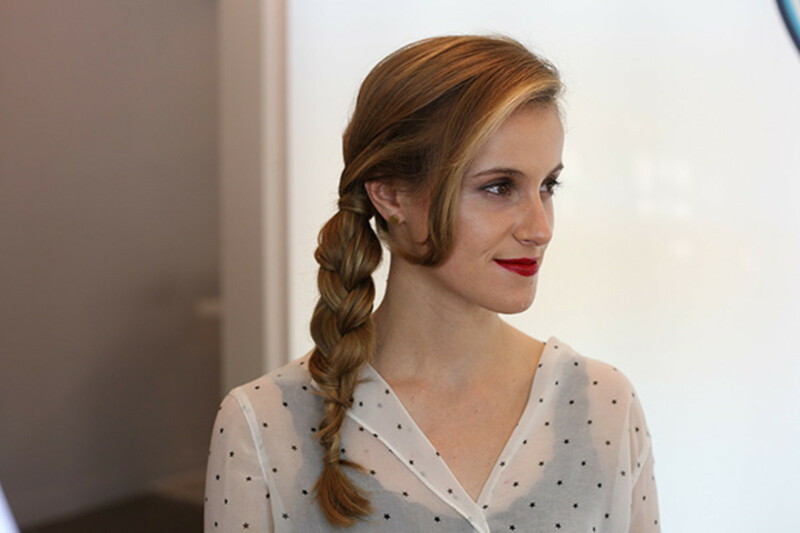 You will need small clear elastics, a teasing comb, bobby pins, and hairpins for this look. Pull out a small chunk of hair to frame your face on the side of your part. Pull another section with the hair that immediately frames your face in front of your ear on the side opposite your part. Make a third portion with the rest of your hair, swept to the opposite side of your part (the section of your hair behind portion 2). Draw the section with the rest of your hair (behind your ears) into a ponytail, and tie it with a small clear elastic just under your ear. Tip: Tying the elastic in line with your earlobe keeps your ponytail as close to your neck as possible. Braid your side ponytail, leaving an inch of hair unbraided at the bottom. Tie with a clear elastic. 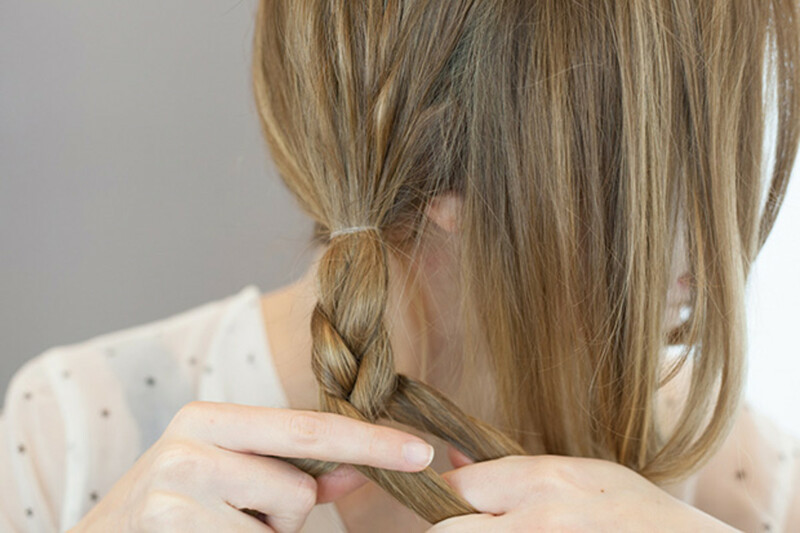 Make this look extra-polished by wrapping a small piece of hair from the end around the elastic at the bottom of your braid and securing it with a bobby pin from underneath. Now that you’ve got your braid on one side, it’s time to take care of the other side. Take the section of hair you left in front of your ear on the opposite side of your braid, and sweep it around the back of your head toward the braid. Wrap the tendril of hair around the base of your ponytail going clockwise. Secure it with a bobby pin where the wrapped hair ends. Next you’ll do the same thing with the hair in front of your ear on the braid side—but wrap it in the opposite direction. For this, take your hair, sweep it back toward your side ponytail, and wrap it around the elastic (where you just wrapped the other piece of hair) going counter-clockwise. Secure it with a bobby pin where the wrapped hair ends. Note: You may want to (or have to, depending on the length of your bangs) leave some hair still hanging around your face. You’ll style that later. 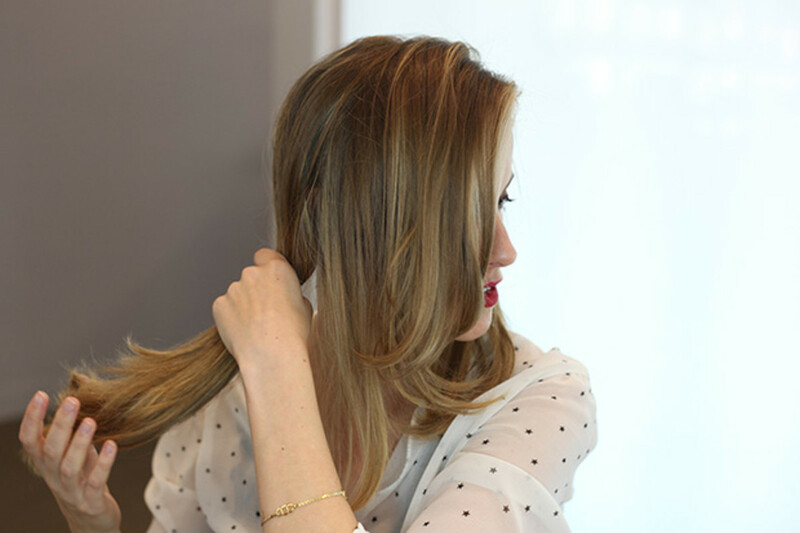 Find the longest hair poking out of the end of your braided side ponytail, and pull it. 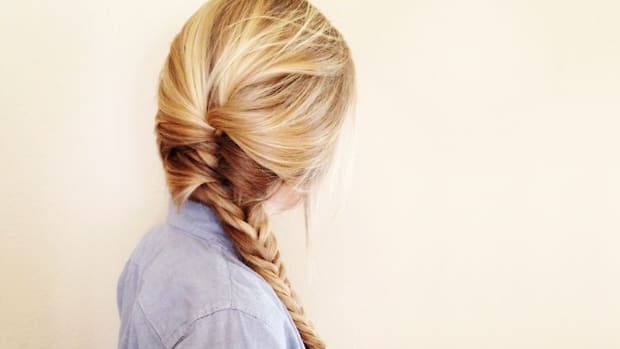 As you pull on the braid, grab hold of the elastic at the end, and squish your braid up so that it begins to bunch. Keep pulling and bunching until it can’t bunch any further. 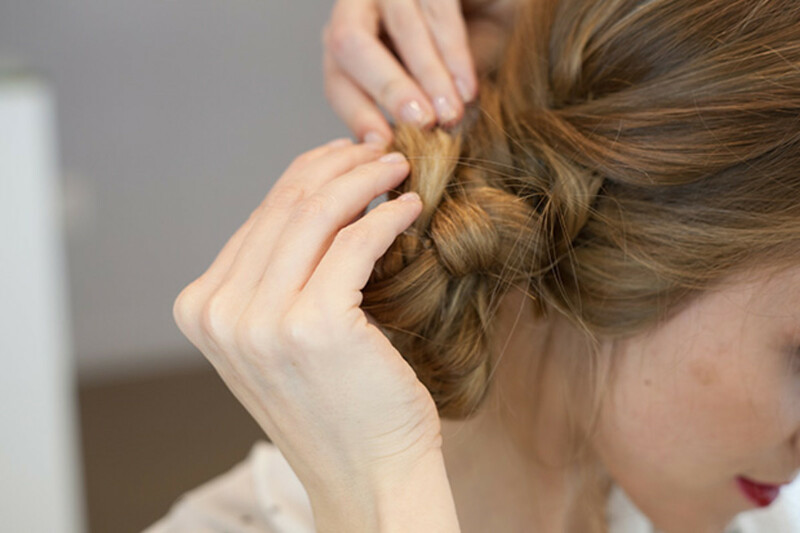 Take your bunched-up braid and wrap it clockwise around the base, like you’re making it into a bun. 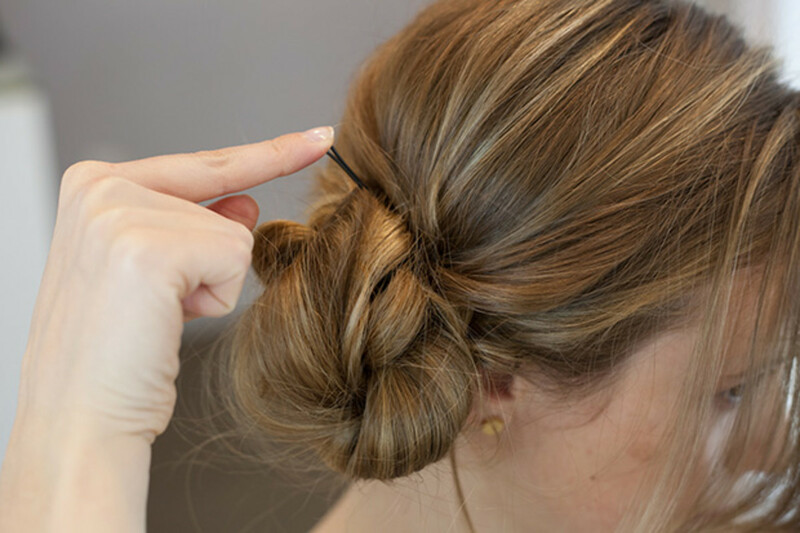 Secure the end with a bobby pin tucked under the braid as much as possible. Take hold of the bubbles from the braid, and begin to pull on them. Be gentle, but firmly pull on opposite sides of the braid simultaneously. This will begin to give the bun a fuller look. Once you’re satisfied with the fullness you’ve achieved, begin to secure the loops of your chignon with the long hairpins in an up and downward motion. By “up and downward” I mean this: Put the pin through a piece of hair, pull up a bit, and then make the pin dive back down toward your head, where it will secure itself in your hair. Repeat until everything feels secure. Spritz any flyaways, and use hair spray. 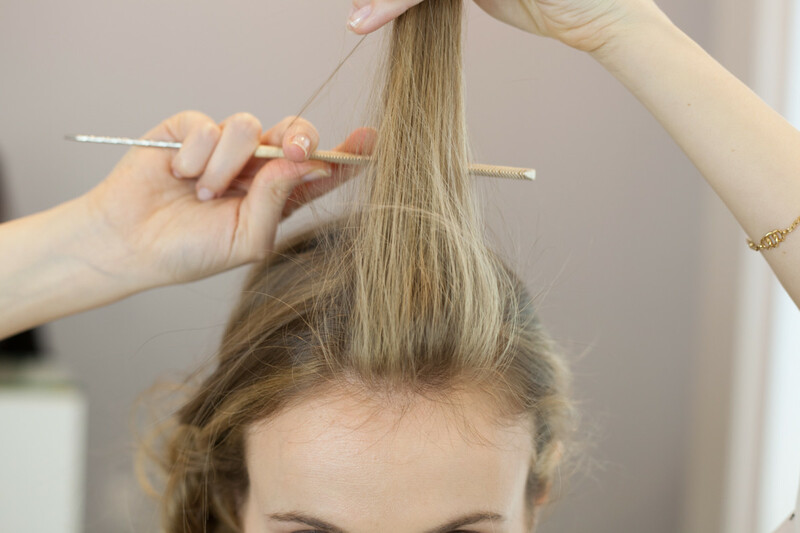 Tip: Use the end of a long hairpin to smooth out any bumps by gently combing through your hair in long strokes. Take any remaining hair in the front that has fallen into your face, and gently curl the ends with a curling iron. After that, pull the hair straight up off your head and lightly tease the base of the strands. This will give you just a touch of added volume. Then let the long bangs fall naturally to the side. Shield your face with your hands, and give yourself a good dose of hair spray. 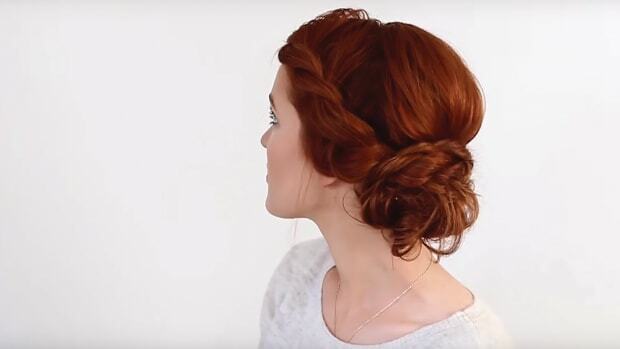 There you have it, ladies—a perfectly romantic updo that you don’t need to pay someone to do for you. 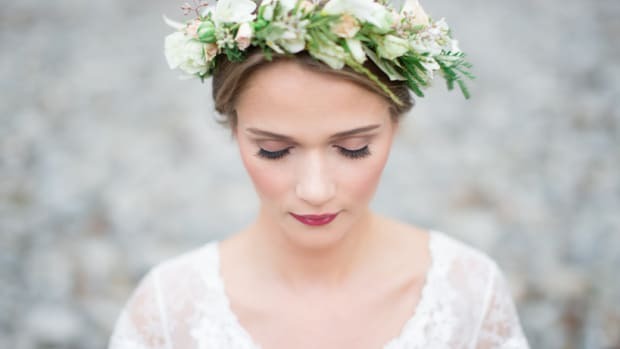 Allow yourself a couple practice rounds before the big day, and you’ll have picture-perfect bridal hair.